Coconut, considered to be a superfood by health and nutrition experts, is one of the wonders of nature that often goes unexplored or ignored. If you really want to stay healthy and live an active lifestyle, you must include coconut in your diet. This article covers the top 10 benefits of coconut oil with supporting research work. At the end of this article, you need to decide whether or not to include coconut oil in your diet. Fight Your Fat: Belly fat is a constant annoyance both in terms of overall look and of course, numerous health complications associated with persistent stomach fat. This fat is the most dangerous fat in our body and leads to health problems. Abdominal fat is one of the primary sources of bad cholesterol, which in turn disrupts the blood sugar balance, paving the path for heart diseases, diabetes and other health problems. A study conducted on 40 women revealed that inclusion of 30ml coconut oil in their daily diet helped them to reduce belly fat and they registered a waist circumference reduction in 12 weeks. A similar study on men showed a reduction in waist circumference by 1.1 inches in 4 weeks. Coconut Oil and Alzheimer Disease: Medium Chain Triglycerides and Ketone are fatty acids found in coconut. Studies reveal that ketone is an alternative energy source for malfunctioning brain cells as found in patients of Alzheimer Disease. The study shows that ketones reduce Alzheimer Disease symptoms. Another study conducted in 2006 revealed that for patients dealing with mild Alzheimer Disease immediate brain function improvements are seen after they consume Medium Chain Triglycerides. 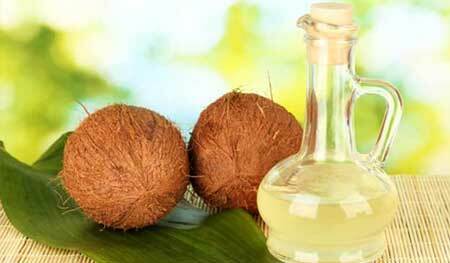 Fatty Acids and Epilepsy: Coconut is the richest known source of saturated fat. 90% of all fatty acids found in this fruit are saturated fat. Recent studies show that the concept of saturated fat causing artery clogging was nothing but a misconception. Coconut contains Medium Chain Triglycerides – a type of fatty acid – that is absorbed by the liver directly from the digestive tract. These MCTs have a different metabolism pattern. During metabolism, these MCTs break down into ketone bodies. High amounts of ketone bodies in blood have been found to reduce epileptic seizures in children. More Coconut Equals Better Health: In south pacific, there is population of humans called Tokelauans who derive 60% of their calorie requirements from coconut and there are no evidences of any type of heart diseases in that population. Coconut Reduces Blood Cholesterol: Bad cholesterol gets converted to benign subtypes because of saturated fats. These saturated fats are responsible for increasing the level of good cholesterol. A study conducted on 40 women shows a significant increase in good cholesterol and decrease in bad cholesterol by consumption of coconut oil compared to soybean oil. Because of increase in good cholesterol, the risks of heart diseases are reduced significantly over the long run. Anti-Bacterial, Anti-Fungal and Anti-Viral Properties: Coconut oil contains Lauric Acid which is capable of killing pathogens like fungi, virus and bacteria. Coconut Oil and Hair Care: Studies reveal that coconut oil when applied on hair not only nourishes and repairs damaged hair but also blocks 20% of harmful UV rays of sun. This oil also helps to prevent itchy dry scalp and eliminates flaking. It reduces static electricity in hair makes it shiny. Skin Care and Coconut Oil: Coconut oil is found to cure dry skin problem by moisturizing skin’s lipid content and hence, it can be used as a daily moisturizer. Coconut Oil against Cancer: Cancer cells thrive only through fermentation of amino acid and glucose producing excessive lactic acid. Extra virgin coconut oil alters the metabolism mechanism of cancer cells and neutralizes the acidity produced by the cancer cells. This improves cellular oxygenation within the body and hence, helps in killing cancer cells. The Omnipresent Antioxidants: Antioxidants seem to be present in almost all fruits and vegetables and coconut oil is no exception. Rich in antioxidants, it can kill free radicals and prevent premature aging and a myriad of other health problems that can occur because of these free radicals.